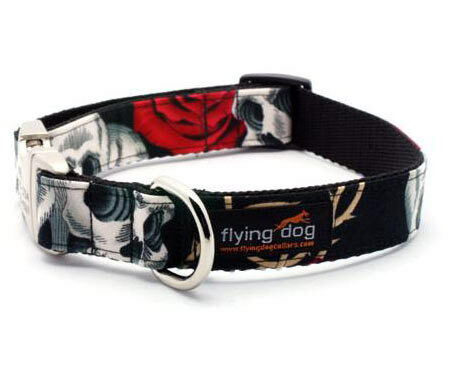 Designer dog collar Axel, white skulls and red roses on a black collar. Personalized with a custom engraved buckle. with personalized buckle, white skulls and red roses! 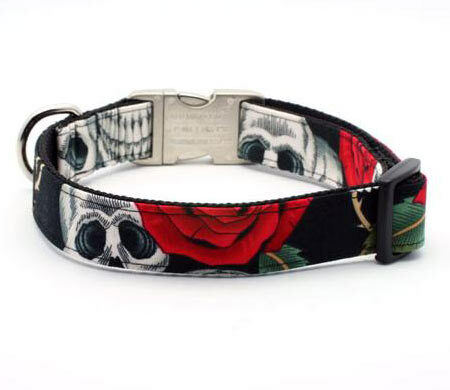 Colors: white skulls on a black dog collar, thorns and red roses. Black webbing. 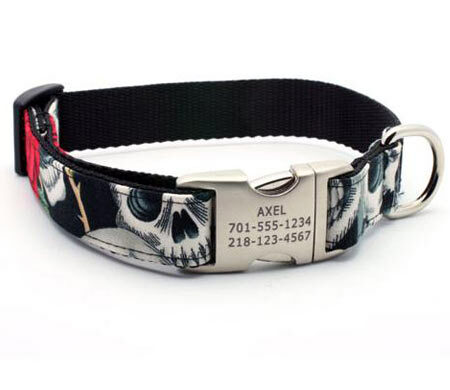 The Axel Designer Dog Collar was inspired by GNR's front man with its jet black background adorned with skulls, thorns and roses. A collar for devil dogs and angel dogs! Matching leashes available in 4, 5 or 6 ft lengths. 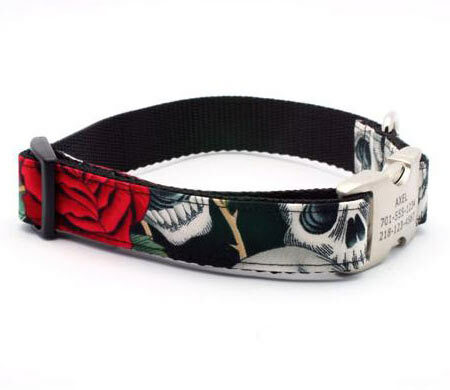 The Axel dog collar with skulls, thorns and roses in black, white and red. Designer Dog Collar, personalized with custom engraved buckle for your dog's name, ID text. For devils and angel dogs. From XS extra small 8 inch, up to XXl XL extra large 28 inch neck. For tiny dog breeds, extra small dogs and small puppies, small, medium, large and giant extra large dogs, up to neck size 28 inches! Handmade personalized designer dog collar with custom engraved buckle. Red Roses and White Skulls design on black background. Skulls and Crossbones dog collar. A black dog collar with skulls for Haloween or all year round!